There was a good turnout at the last South Carrick Decides meeting. People in Girvan and South Carrick are being encouraged to show their support for local community groups by voting on their favourites. The South Carrick decision day will be held at Girvan Academy between 11am and 3pm on Saturday 18 February. A fund of up to £38,000 is available at the event, with £20,000 available for projects dealing with specifically with children and young people, with a further £18,000 for general community groups in the South Carrick Area. 38 community groups will be pitching to an audience of local people about their proposal and how it will benefit the community. After all the pitches have been heard, the audience will vote to decide which groups should receive funding. Groups looking for funds for children and young people projects can be funded up to £2,000 for use in local projects, with general community grants available for up to £1,000. The event is part of a new way to encourage people to get actively involved in local decision making known as ‘Participatory Budgeting’. South Ayrshire Council and the Girvan and South Carrick Villages Locality Planning Group is inviting people from Girvan, Dailly, Barr, Colmonell, Lendalfoot, Ballantrae, Barrhill Pinwherry & Pinmore to get involved and register to vote. 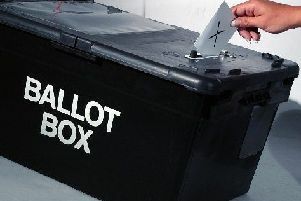 Anyone over the age of eight is able to take part in the electronic vote. Councillor Bill McIntosh, Leader of South Ayrshire Council, said: “We’re committed to working with our communities to make life better and this new approach proved to be very popular after its introduction in 2016. The last event in Girvan was a big success, with 116 people voting to give 21 community groups their share of the £15,000 available, with even more money available this time around. The money was made available from South Ayrshire Council, Scottish Government, and the South Ayrshire Health and Social Care Partnership. The ‘Decision Day’ event takes place at Girvan Academy on Saturday 18 February between 11am and 3pm. Anyone wishing to vote must register between 10.15 and 11am.